We have all seen delicate glasses built up into pyramid shapes with chilled champagne being poured very carefully into the top one with the champagne cascading down into tiered glasses, this idea, along with chocolate fountains are fast becoming one of the main features at weddings. It therefore comes as no surprise to find out that fountains are taking the place of waiters walking around the room with balanced trays of drinks. Picture a wedding reception during the summer months with cool rose wine flowing through a fountain. Have delicate glasses close by for your guests to drink from with a selection of cheese and crackers while you and your loved one are having photographs taken. Or you can really go to town and have a few fountains on a long table with a selection of white and red wine as well as a non alcoholic drink on hand with an added selection of nuts and fruits. A drinks fountain is today’s version of the punch bowl but without the added mess of that sticky ladle being manhandled and dropped on the floor. Once the drink has been poured into the fountain it will be constantly pumped to the top tier and cascade down until it reaches the main bowl below before it again starts the journey back up to the top. For that extra special touch fruit can be added to the base of the fountain. Guests can help themselves to chilled drinks from the waterfall effect without having to worry half as much about any nasty puddles forming. Fountains can be hired or purchased from just about anywhere these days and prices differ vastly so take the time to look around for the best deal and weigh up what the best choice will be for you. 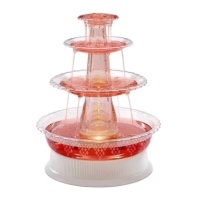 Whether you choose to hire or buy a drinks fountain for your wedding reception depends on several factors, which we outline below. 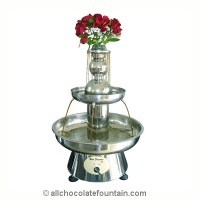 With a hired fountain a trained staff member of the company will be on hand during your function. They will erect and dismantle the fountain and in between will maintain and keep the drink flowing and your guests happy. Companies offer a choice of wines and cocktails and you can either remain with the same drink or have them change it halfway through your reception if you wish. The beauty of hiring the fountain is you will not have to worry about anything with regards to the drinks or any of your guests taking liberties and practically sitting underneath the fountain drinking it dry. Will cost you more money but gives you peace of mind. Ascertain how long the fountain is on hire for. Check how much drink they will be supplying. Find out if they supply glasses. What is their insurance policy. Make sure there is no hidden costs such as delivery or VAT. Ensure an experienced operator will set up, maintain, clean and dismantle the fountain. If you hire but don’t wish to have an operator, double check on maintenance, insurance and date of return. Ask when the fountain was last safety checked. When you opt to buy a fountain you will have to ensure either yourself or somebody else is ready, willing and able to set it up, keep the drinks flowing, dismantle and clean when finished. There are plenty of low budget drinks out there that can be used as an alternative to champagne or have lemonade/soda water added for a spritzer and make it go further. You get to keep the fountain afterwards and can use it for special parties or just when you have guests and save you going back and forward to the fridge. Will save money, important if you are on a tight budget and also it's yours to add whatever drink that you want. Others ideas are cider, fruit juice, pimms or wine. Non alcoholic drinks or even iced water can be used. 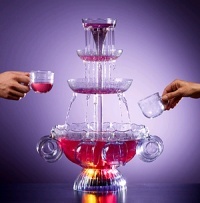 Cocktail fountains can come with different shades of lights and made from clear perspex to silver and can hold from 20 plus servings.